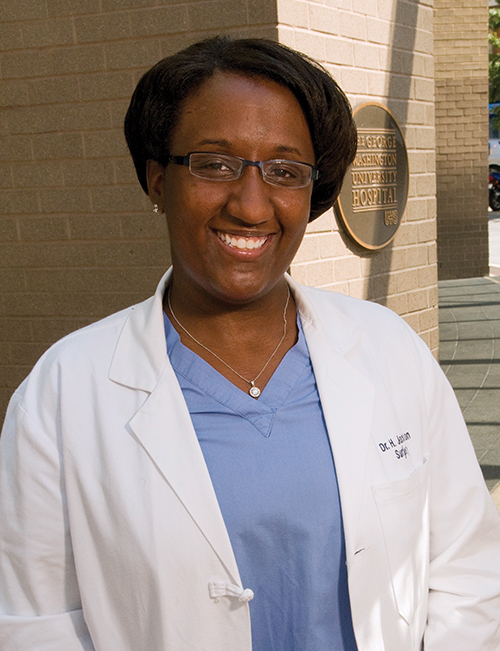 Dr. Hope Tiffany Jackson is currently a senior fellow in minimally invasive foregut and bariatric surgery at the University of Washington in Seattle, Washington. She completed her undergraduate and medical studies at Emory University and the George Washington University respectively. During that time, she developed an interest in health projects that inform, engage and excite children and adults about leading healthy lives. This interest led her to complete internships during medical school and residency at the Center on Media and Child Health in Boston, the medical unit at ABC News in New York City and the popular television series, Greys Anatomy filmed in California. Dr. Jackson completed her surgical residency at the George Washington University in Washington, DC where she received awards for excellence in teaching, research, clinical care and humanism throughout her training. She has presented her research at national meetings, authored book chapters and published in peer reviewed medical journals. During residency, she also completed a medical education and leadership development fellowship which has prepared her well to develop innovative education initiatives and pursue her passion as a surgical educator. She completes her minimally invasive surgery fellowship in the summer of 2017 and will look to continue her career as an academic surgeon with a focus on surgical education and medical communications. Her goal is to use both education and the media as tools to deliver impactful health information to the communities that need it most. As a proud member of Delta Sigma Theta Sorority, Inc, Dr. Jackson looks forward to the work ahead as our community continues to make strides in increasing access to and optimizing patient care.